Please refer to our stock # B-22 when inquiring. 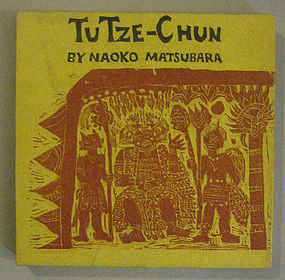 Tu Tze-Chun by Naoko Matsubara. 1965 First Edition; Kodansha, Japan. Hardcover with cardboard slipcase covered in hand-laid Japanese paper, complete with wraparound paper band. Condition=Excellent, Collectible. "No one knows just how long ago the legend of Tu Tze-Chun came to Japan from China, but we do know tat it was retold some forty-odd years ago by Ryuunosuke Akutagawa (known best to Westerners for his popular story "Rashomon". ), and that it has subsequently become an extraordinarily popular story in Japan. It is presented here in English for the first time, the story of a boy who squanders fortunes, spoils a chance to gain untold power, and eventually finds immortality by being very, very human. The art of woodcut printing for which Japan is so famous is found here in its modern, and yet ageless, form. Naoko Matsubara's prints have captured the spirit of Akutagawa's tale in a singularly arresting way, making this a volume to be treasured by those who seek the unusual in books from the Orient. Naoko Matsubara was born in Tokushima Prefecture in Shikoku, Japan in 1937, the second child of a Shinto priest and a teacher of home economics. At the Kyoto City College of Fine Arts she majored in graphic design, graduating in 1960. Shortly thereafter, the promising young artist went to the United States on a Fulbright travel grant to accept an assistantship at the Carnegie Institute of Technology in Pittsburgh, PA, where she received her M.F.A. in Design in 1962. She also studied graphic design at the Royal College of Arts in London. Miss Matsubara presently resides in Kyoto, conducting a popular course in woodblock printing in the International Design Research Center, and continuing, of course, her own active career as an artist whose inventiveness and unrestrained, powerful style have brought vigorous new life to the art of woodblock printing." Naoko Matsubara also studied woodblock printing with Munakata Shiko, who was a giant in the field of mingei (folk craft,) along with his colleagues Hamada Shoji, Yanagi Soetsu, Kawai Kanjiro, and Bernard Leach. Naoko Matsubara's sister is the novelist Hisako Matsubara. They collaborated on the Japanese tale "Taketori Monogatari" in German. Naoko did the illustrations, while her sister did the actual translation and the commentary.